“And no man having drunk old wine desireth new; for he saith, ‘The old is good.’” The Gospels were clear on the value and importance of mature wine. Two thousand years later, in this, as in all matters intangible, there is less certainty. 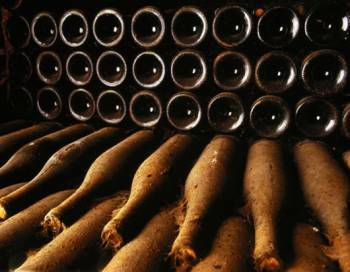 Retailers report that customers regularly reject the older vintages of a particular listing, seeking instead the current release. The Butcher Shop’s Alan Pick famously stated that he can’t sell any thing over five years old. Yet not so long ago – certainly no further back than the 1990s – the standing rule for cabernet-based reds wines was that they shouldn’t be opened before they were ten years old. Some of this is doubtless a matter of fashion: as more and more younger wines are rated and consumed, wine drinkers have come to acquire a taste for primary fruit and the spice and texture imparted by new oak. As wines move into their next phase of development, these elements begin to fade, to be replaced (in the case of wines made from the so-called noble or premium cultivars) by the more subtle nuances of secondary characters. For consumers unfamiliar with these more earthy (and sometimes more fungal) notes, older wines are frankly less attractive. While they certainly know that historically greater value was attributed to older bottles, they assume that something has changed in the winemaking and get on with the business of celebrating the instant gratification made possible by the latest cellar practices. They’re not entirely wrong – both in these assumptions, and the conclusions which flow from them. In the dying days of the little ice age – in other words, until the 1980s and 1990s revealed that the earth was moving into a phase of cyclical (and perhaps anthropomorphic) climate change, it wasn’t always possible to fully ripen fruit in the fashionable appellations of the Old World. The decade of the 1960s is notorious for some of the worst vintages on record: the great 1961s were not only an aberration, they were more a result of absence of water than intense heat. With the risk of late summer rains (in Bordeaux and Burgundy) growers were less inclined to play chicken over hang-time, and the typical alcohol readings of that era – 11-12% (after chaptalisation) compared with 14%+ today – tell their own story. These slightly greener wines needed bottle time to harmonise, and the ten year rule saw them from their slightly under-ripe primary phase into a more interesting secondary stage. Climate change alone does not fully account for what has happened across the world of wine. The rise of the New World has contributed its own dynamic. The major red wine producing areas of the Cape, California and Australia were never as marginal as the European appellations at the northernmost limits of viable viticulture. Ripeness – what the Australians marketed as “sunshine in a bottle” – became something of the USP of these non-European offerings, at the same time as the centre of gravity of influential wine criticism shifted westwards across the Atlantic. Robert Parker made his international reputation with the 1982 Bordeaux vintage – the first of a series of warmer, riper harvests which transformed the way Old World wines were being produced. The pursuit of wine styles which were rewarded with financially gratifying critical acclaim in what was becoming the biggest market in the world for classical wines led to a number of changes in viticultural and cellar practices. Softer, rounder tannins became something of a Grail objective, leading to a focus on more even ripeness (achieved through better viticulture and then through sorting tables), longer hang-time (which climate change helped to make possible) and new oak vinification. Alcohol levels rose, jarring acidities – and all vaguely green notes – were eliminated and suddenly wines which needed a decade to settle down and marry became more or less instantly drinkable. Extended maturation was no longer a prerequisite – and within a few short decades a generation of wine drinkers redefined its taste preferences so that the virtues of age – to the extent that they were discernible – were no longer perceived as desirable features. But old habits die hard, and the message from the Gospel of Luke remains deeply ingrained in our culture: we still think we should attribute greater value to mature vintages, just as long as we’re not expected to drink them, or even to go out and buy them on auction. Is this just a hangover from the past, like believing in books while reading a Kindle? Don’t ask me: I love the secondary and tertiary characters of classical wines served at the peak of maturation. I prefer their nuance and complexity, the forest floor, spice, and whiffs of mushroom to the pungency of primary fruit, but then I get pleasure from beautifully printed and expertly bound books (though anything I would buy as a paperback I’m happy to have on my Kindle). But it doesn’t have to be an either/or: when I travel I take with me an electronic library; in most restaurants I’m compelled to order wines whose charm lies in their primary fruit. When I’m at home I have hard copy books, and wines which have settled comfortably on their plateau of maturity. Previous articleWho’s making SA’s best wine and how much should you spend for it?